Marcel L'Herbier's oft overlooked silent masterpiece, L'inhumaine (The Inhuman Woman) is one strange animal. 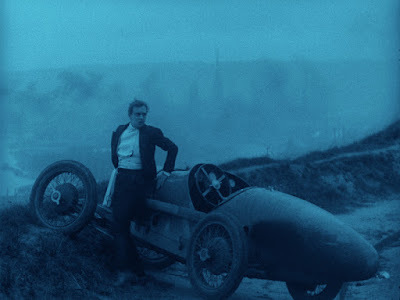 A delirious pastiche of cinematic styles, from French Impressionism, to German Expressionism, to Soviet Montage, L'Herbier's film feels like a sweeping portrait of the state of the art in 1924. 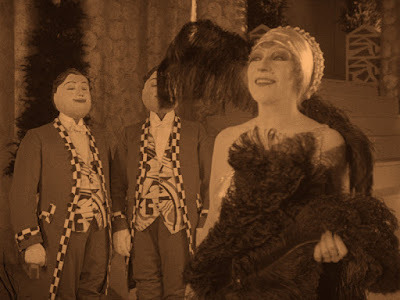 The film centers around a wealthy opera singer (real life prima donna Georgette Leblanc), who holds court over a host of suitors vying for her affection. With great relish she teases and torments each man as he throws himself at her feet. One man in particular, a young scientist named Einar (Jaque Catelain), falls so madly in love with her that he commits suicide after she spurns him, leading the town to violently turn its back on the once popular diva. But when the stunning truth at last comes to light, a scientific breakthrough that can allow people to live forever comes to light, and the opera singer soon discovers that it is truly possible to become the "Inhuman Woman" that the public has referred to her as all along. In some ways, L'inhumaine feels like a precursor to Fritz Lang's Metropolis (1927), with its grand, expressionistic science fiction elements. L'Herbier introduces his film as a romantic drama, one that exudes sexual tension and dread at every turn. The prima donna's lavish parties are attended by servants in grinning masks, rendering them deaf, mute, and perpetually smiling. It's an eerie, haunting, almost dream-like world, and L'Herbier takes us on a journey into the dark depths of romantic obsession before taking a hard turn into science fiction in the film's final third. The most striking difference between L'inhumaine and Metropolis, however, is their views on technology. Whereas Lang viewed technology as man's ultimate downfall, L'Herbier envisions it as humanity's salvation. It's a remarkably prescient work, imagining a world connected by technology, connecting artists with their public as never before. Rather than take a dystopian view of the future, L'inhumaine takes an almost utopian turn, a striking turn of events after its rather grim view of humanity at the start. Whether or not technology ultimately brought out the best in us, as L'Herbier contends, is up for debate, but it's hard to ignore its uplifting optimism that stands in stark contrast with other science fiction films of the period (and beyond), which envisioned a world of technology run amok. L'Herbier has a tendency to overindulge, letting his sequences of debauchery go on for unusually long periods, but the effect is nothing short of intoxicating. He creates such an indelibly realized world, featuring striking use of deep focus and sweeping cityscape shots, that immerse the audience in his singular vision. 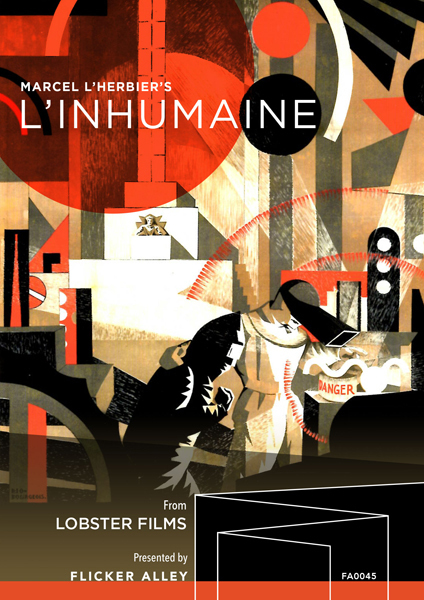 L'inhumaine is the latest silent classic to get the Blu-Ray treatment for the first time from Flicker Alley, who seem to have made it their mission to shine a light on otherwise forgotten masterworks of the period. After dominating the speciality market last year with releases of Chaplin's Essanay Comedies, Man with a Movie Camera and Masterworks of American Avant-Garde Experimental Film, Flicker Alley has started off 2016 with a bang with L'inhumaine. Bonus features may be sparse, - a 15 minute making-of featurette, a behind the scenes look at the creation of one of the two scores available on the disc, and a booklet detailing the history of the film and L'Herbier's other work - but they make the most out of the features they do have. They provide an illuminating insight into an all but forgotten piece of cinema history - one that managed to unite contemporary artistic giants such as Pablo Picasso, Man Ray, Erik Satie, René Clair, James Joyce, and Ezra Pound in one key crowd scene. There's really just nothing else out there like it. And now at long last it has received the gorgeous, beautifully restored Blu-Ray release it deserves. Now available on Blu-Ray from Flicker Alley.